Aresm is the bearing strength of the resin to be determined according to the 2.8 Reference Standards: Group 7. Xs is taken as 1,0 for holes with normal clearances or (1,0 - 0,1 m), for oversized holes m is the difference (in mm) between the normal and oversized hole dimensions. In the case of short slotted holes as specified in 2.8 Reference Standards: Group 7, m = 0.5 x (the difference (in mm) between the hole length and width). 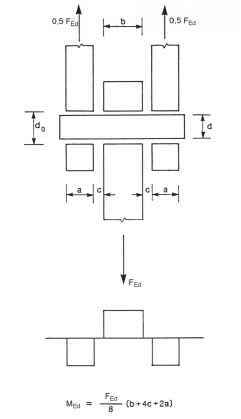 (6) When calculating the bearing resistance of a bolt with a clamping length exceeding 3d, a value of not more than 3d should be taken to determine the effective bearing thickness ib,resin (see Figure 3.6).